Losing weight often sounds simple, but changing habits takes time, attention and perseverance. Be patient with yourself and start slowly — aim to lose a pound or two a week. But also be diligent: Keep a food journal every day and uphold your commitment to a real lifestyle change. 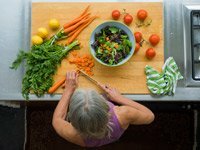 To successfully lose weight, many of us need to relearn (or, in some cases, learn for the first time) how to eat healthfully and become physically active. Our old habits are well ingrained, so take it slowly. Be kind to yourself. 1. Set a weight-loss goal: If you are significantly overweight, a 10- to 15-percent reduction of body weight can significantly reduce your risk of heart disease and other conditions. You will achieve long-term success by making changes over an extended period. But don’t try to do too much too quickly. Recommended weight loss — regardless of your starting weight — is usually no more than 1 to 2 pounds per week. Instead, feed your body nutritious fuel by learning what is really in the food you eat — ingredients and calories. Eat more fruits and vegetables. Choose foods from the entire rainbow to make sure you get the necessary vitamins, minerals and phytochemicals (cancer-preventing substances found in naturally colorful foods) that can help prevent disease. Proper portion size — even with nutritious foods — is also key to weight loss. For optimal health, choose a variety of foods that include complex carbohydrates and lean protein. 3. Stay conscious: Awareness is a key principle in lifestyle change. Keep a food journal to help you remain conscious about your eating and eating patterns. Record the food, amount and number of calories. Include any taste testing done while you're making dinner. Record immediately — don't wait. Selective memories will hurt you when it comes to food consumption. Carry your food journal everywhere. Use a small notepad in your pocket. In a crunch, a spare napkin will do. 4. Make a strong commitment to a lifestyle change: Challenge yourself and strengthen your commitment to a healthier lifestyle by asking these questions each week. Is my daily calorie intake appropriate? Is my fat intake less than 30 percent of my total calories? Is the diet balanced? Am I eating the appropriate number of servings from different food groups? Is my outlook about weight management and health a positive one? Do I have patterns that interfere with my losing weight? Do I get 30 minutes of exercise in daily? Can I increase this amount? Can I do playful activities to help increase my cardio time and make it more enjoyable? Again, changing habits can take time. But when the going gets tough, don't quit. Recommit.